Updated Tuesday April 24, 2018 by Greenwich Village Little League. Discounted tickets are available for purchase ORDER NOW!!! EVERY CHILD WILL RECEIVE A VOUCHER FOR 2 FREE TICKETS TO ANOTHER GAME in 2018. 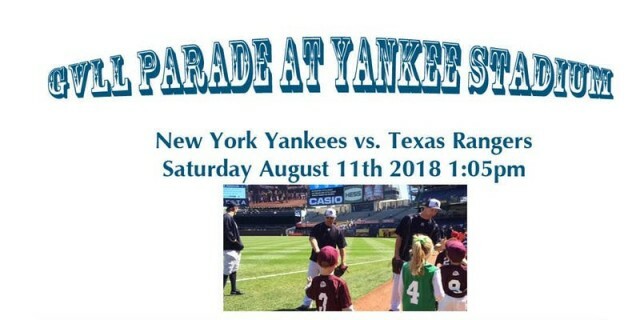 ** GVLL PLAYERS WILL PARTICIPATE IN A PARADE ON THE WARNING TRACK AT YANKEE STADIUM PRIOR TO THE GAME. PLAYERS MUST BE IN GVLL UNIFORM TO PARTICIPATE IN THE PARADE. A LIMITED NUMBER OF TEAM MANAGERS & CLEARED COACHES WILL BE ABLE TO JOIN THE PARADE TOO. PARENTS WILL NOT BE ALLOWED ON TO THE FIELD. Players should wear their team uniforms to the game! "Are we suppose to meet earlier to organize the parade?"